In our third solo exhibition with the Berlin painter Roger Wardin, we present a new series of works in which the artist deals with German Romanticism. This defining epoch gives Wardin the opportunity to reflect on dreamful and irrational utopias and to explore their contemporary significance. The exhibition title, “Full Moon Fiasco”, evokes the ambivalence of this theme: longings, which manifest themselves in atmospheric landscape motifs, still play a role, but are ironic and their credibility is questioned. In some of his current pictures, Wardin refers directly to the most famous motif of German Romanticism, the monastery ruin Eldena by Caspar David Friedrich. With his own signature style of painting, consisting of an interplay of oil, acrylic and paints, piles of paint, overpainting and blurring, Wardin decomposes the original subject of the picture. 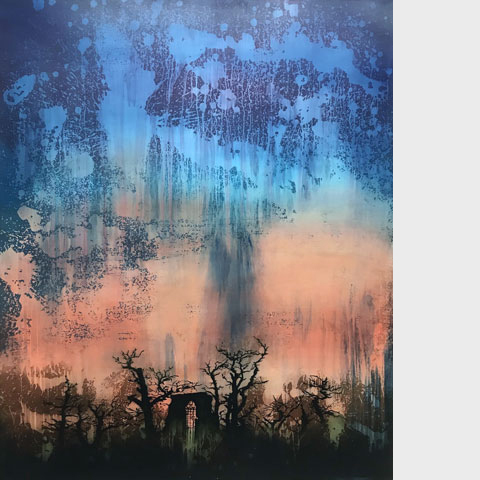 The different facets in this series of works, which range from close references to romantic motifs, to complete decomposition into painterly abstraction, thus reflect various approaches to dealing with emotions and moody soul landscapes. Our present-day high-tech presence raises as romanticism did in the past, questions about the limits of science and progress. This parallel resonates in Wardin’s painterly exploration as well, revealing a longing for neo-romanticism, but at the same time being distorted and questioned by volatility and dissolution in the painterly process. In this way, the observer is stimulated to reflect the relevance of dreamworld and the world of emotions in our global reality and to redefine the question of the justification or non-justification of romantic utopia. Roger Wardin b. 1971 in Berlin; lives and works in Berlin; 1993-1996 studied Fine Arts at the Staatliche Hochschule der Künste/Städelschule Frankfurt a. M. and at the Art Academy Düsseldorf with Prof. Jörg Immendorff; et. al. 1995 Erasmus scholarship at the Glasgow School of Art; 1997-2001 study of Fine Arts at the University of the Arts Berlin with master’s degree; Exhibitions et. al. : 2018 “A Perfect Storm”, Livingstone gallery, The Hague, The Netherlands; 2017 “Es geht den Menschen wie den Leuten”, C & K Galerie Berlin; 2013 “Return to Forever”, Kunstverein Duisburg, Duisburg.